The crew gathered at Alan's House at 9am and headed off to Stoke Prior via the Pork Pie shop, where the two Pork Pies that Jim had pre-ordered were collected, still warm. They arrived at Morrisons in Bromsgrove at 11-40, where all-day breakfasts were enjoyed before collecting sufficient provisions for the week. After reporting at the boatyard, the crew were informed there would be a 45 minute wait before the narrowboat "Holly" could be collected. Therefore the crew chose the spend the time available at the "Navigation" where one pint of London Pride was consumed. After explaining to the boatyard staff the superior experience and knowledge of the crew, they decided that Holly should be the first boat to leave the yard and ascend the 36 Tardebigge locks. These were expertly navigated by the experienced crew in a mere 3 hours 15 minutes. The expected very bad weather during the afternoon turned out to be quite mild with only a little light rain at times. 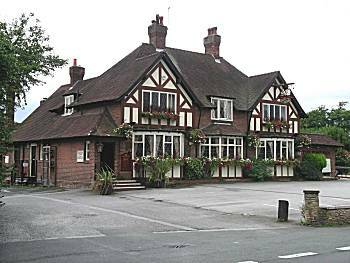 Alvechurch was reached at 6-45pm where after a little debate and the use of a runner (Ron), the "Crown Inn" was selected to spend the evening. A little difficulty was found mooring at this location due to the reeds and damaged bank. The fare in the pub was well received and washed down with 5 pints of "Bombardier" and "Flowers" ale. The crew were exhausted after their first day and returned to the boat for cheese and biscuits before retiring for the night. There was considerable heavy rain during the night. The crew were up and underway at 7-50am anticipating the long journey through Birmingham to Merry Hill. 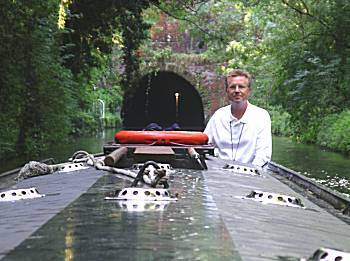 The Wast Hill Tunnel (2726yds) was traversed successfully following 2 other boats, in 27 minutes, with Ron at the helm. A breakfast stop was made just north of Norton Junction, where Jim prepared an excellent breakfast. Favourable comments were made about the flavour of the Morrisons sausages and the lack of baked beans were noted (forgotten at the provisions gathering stage). The spirit of the crew was much lifted by the sight of a number of female joggers out for a Sunday morning run. 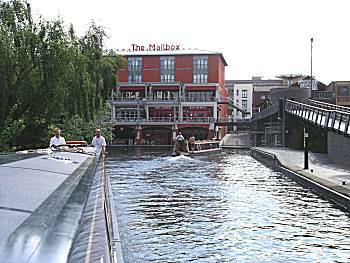 Birmingham Gas Street basin was reached at midday where a long wait was made to fill with water whilst Ron and Alan went to find a Tesco Express to purchase Organic Baked Beans and supplies of toilet rolls. After travelling through Gas Street Basin and mooring just after "Old Turn", the crew were allowed a short shore leave to visit the "Malthouse" where 3 pints of Courage Directors were consumed (except Jim) before returning to the narrowboat for Pork Pie, wholemeal bread and salad on the move out of Birmingham. The journey down the "Birmingham Main Line" was uneventful, before making the tight turn towards the Netherton Tunnel (3,027 yds). Albeit slightly longer, this tunnel was much wider and straighter than Wass Hill Tunnel and was negotiated in a mere 33 minutes. Later the crew negotiated the only lock of the day immediately after turning from the Dudley Canal into the Stourbridge Canal at Park Head. The delights of Waterfront on a Sunday night proved very disappointing for the crew. Dinner of Fish Pie (Except Jim) was enjoyed at The Brewers Wharf where full advantage was taken of the "Two for One" meal offer. Three pints of Banks Original was enjoyed before dinner with a further pint during the meal. Afterwards a visit was made to Wetherspoons, where the Marstons Pedigree was considered to be of poor quality. Carl, the colleague met during the last skiing trip by two members of the crew was not on duty that evening. Although it was feared that the the loud music from the local nightclub might keep the crew awake, the weary crew fell into a deep sleep until awoken by very noisy road sweeping activity outside in the early morning. The crew were up before 7am and underway shortly afterwards anxious to start the long descent of the 8 Delph Locks and the remainder of the untried route towards Wolverhampton. Neil prepared a healthy breakfast of Porridge and Toast, which was enjoyed on the move. Jim chose to not fully participate in the breakfast and we believe was missing his traditional fried breakfast. The Buckpool flight of 16 locks were swiftly negotiated, despite Jim side-swiping a moored boat on leaving one lock. The force of a weir stream was blamed for the event, but the other crew were aware of the truth. By the time the boat turned right at Stourton Junction into the Staffs & Worcestershire Canal it was apparent that early starts had put the crew ahead of their planned schedule and quick re-calculations were carried out. The revised plan was to stop for a late lunch and top-up shopping exercise at Wombourne rather than an overnight stop and to head on to Compton for the overnight stop. This may enable a whole day to be gained and make the possibility of a Kingwood Junction excursion possible. The crew were much intrigued by this possibility. 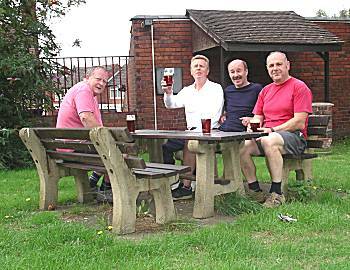 The lunchtime stop was made at Swinton where 3 pints of "Old Hooky" were taken at the "Old Bush" sitting in their beer garden, see below. Compton was reached at 7-30pm in the failing light after a long day of cruising, where a mooring spot was selected right next to the bridge. An evening meal of Gammon Steaks was purchased at the "Oddfellows" public house, together with 3 pints of Banks Original Ale. With the exception of Ron the other members of the crew managed sweets from the menu, but afterwards found this affected their beer drinking capacity. 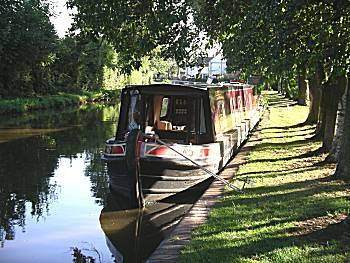 After a short stroll, except Jim, they returned to the narrowboat to retire for the night at 10-30pm!!! The crew (except Jim) were up at an earlier hour and setup off at 7-10 am. Neil prepared porridge, which was consumed on the move with Jim driving. 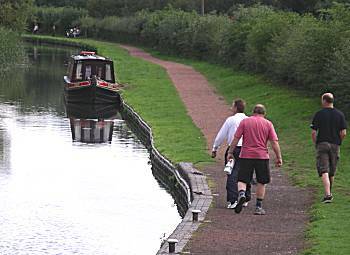 The remainder of the Staffordshire and Worcester canal was completed up to Aldersley Junction in a mere 45 minutes, where they turned to start the flight of 21 locks through Wolverhampton. The highly experienced crew instantly fell into their well rehearsed routine, which enabled the locks to be traversed by 10am. As the fresh water level in the boat had reached the 45% point, a stop for water was made at the BWB Broad Street depot and the crew made welcome use of the other British Waterway facilities on offer. The journey continued down the Birmingham Main Line canal, past many disused and derelict factories. Ron offered to prepare the crew a late fried breakfast which was greatly enjoyed by all. 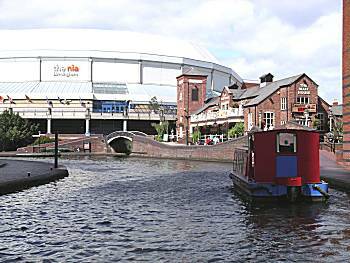 There appeared to be no suitable pubs on this section of the canal and therefore with a 3:1 majority (Jim objecting), it was carried that the boat should continue at great speed towards our night-time destination in Birmingham, where Ale could be enjoyed without delaying the boat. Neil preparing for the high speed section of the canal. A small diversion was agreed to use the Birmingham Old Line rather than the Main Line, via the Spon Lane and Smethwick Locks. 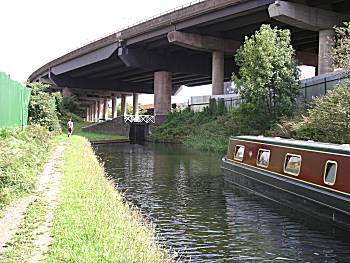 This proved to be most interesting, as the narrowboat travelled underneath the M5 motorway. The crew were concerned when a number of locals advised that there had been no boats seen travelling this section for many months. 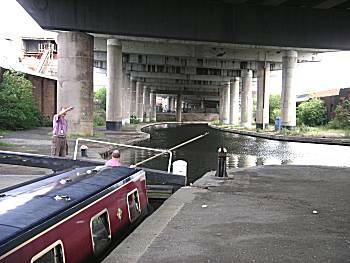 This concern proved justified when the narrowboat ground to a halt in a lock beneath the motorway. Jim found the problem to have been caused by a giant lump of polystyrene jamming the boat against the lock wall. After considerable energy had been consumed attempting to free the boat by reversing, the offending polystyrene was removed by Jim with the boat hook. 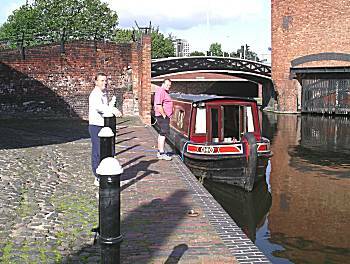 The narrowboat "Holly" again moored in Birmingham and the crew hurried to the Malthouse for a number of pints of Courage Directors. The crew all agreed that the Kingswood Excursion should be attempted starting on Wednesday morning and felt that a Chinese dinner in Birmingham (except Jim) was required to maintain their strength for the extra exertion. The Crew departed Birmingham, after porridge (except Jim), slightly later than normal, stopping at the BWB station to top-up with water and make use of their excellent facilities. The descent down the 13 locks through the heart of Birmingham was uneventful, following a slower boat with a number of younger persons on board. The crew met with two BWB workmen replacing the sluice ratchet on one of the locks. After befriending them, they offered the crew the old cranking pinion as a souvenir. 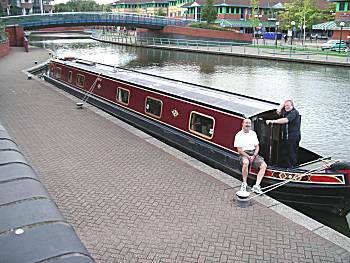 The boat joined the Grand Union Canal out of Birmingham, stopping for a late breakfast, prepared by Alan (with scrambled egg, but no beans). Afterwards the crew realised that to reach the Boat Inn at Catherine de Barnes, great speed would be required, which was accomplished arriving at 2-20pm. It became apparent that a Wake was in progress and the crew watched with great interest. Three pints of Courage Directors (Except Jim) were enjoyed by the thirsty crew. The crew left The Boat Inn for the final leg of their journey to Kingswood Junction, starting their descent of the 5 double width Knowle Locks. The journey stared uneventfully, in tandem with another narrowboat. 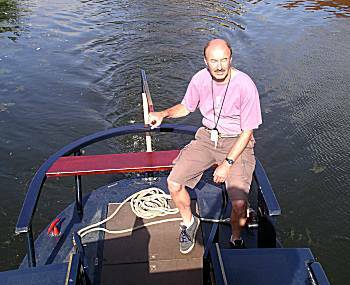 However, on leaving lock 4, catastrophe struck, when the rudder jammed whilst Ron was carrying out the delicate manoeuvre. The lack of control resulted in a collision, which accurately deflected a passing narrowboat into the side of the basin, but luckily the collision deflected their path sufficiently to enabled them to make the fifth lock where, disabled, it completed its passage through the lock. The stricken craft was guided out of the lock into a safe position where the damage caused by Ron's misdemeanour was investigated. As it was considered that the damage was too great for the crew to remedy on their own, assistance was summoned from The Black Prince emergency call out engineer, who promptly announced that he was unable to attend until the following day. Faced with the prospect of no beer or food for the evening, the crew set about repairing the damage themselves, under the guidance of Alan. Helped by advice from a local boatman, and with great difficulty and courage, the rudder was lifted and dropped successfully back into the cup bearing beneath the waterline, enabling the narrowboat to continue its journey. The delays caused by the repairs made the planned destination impossible, therefore an alternative evening destination was selected, being the "Black Boy" at Knowle. This choice proved to be greatly appreciated by the crew who enjoyed, Steaks, Ale Pies and Chicken Madrid dinners, with 3 pints of London Pride Ale (Except Jim). There was rain during the evening, whilst the crew enjoyed their rest in the pub, but it stopped in time for them to return to the narrowboat for coffee and cheese, before retiring. After the excitement of the previous day the crew were up early and away from their moorings at 7am. Porridge was prepared again by Neil on the move, before Ron carefully guided the narrowboat into the Kingswood Lock Junction and lock complex and on to the Stratford-upon-Avon canal. Again the crew snapped into their co-ordinated lock handling mode to enable the rapid passage through the 20 Lapworth locks in an enviable one hour period. 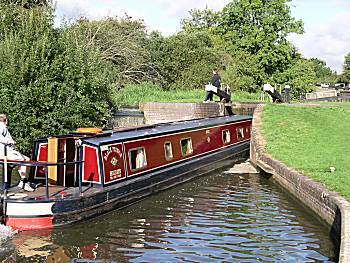 After this exercise, the crew stopped just above the locks at Hockley Heath, to enjoy Jim's breakfast of Egg, Bacon, Sausage, baked beans and tomato, with a little toast. A short stop was made at a Bakery Shop close to Bridge 20, where supplies of Butter, Milk and a Large Pork and Stilton Pie were secured, much to the delight of the remainder of the crew. The jam doughnut purchased by Neil was considered excessive and he was banned to the rear of the boat to consume the said item. After much deliberation a lunch time stop was made by Bridge 17, where the crew made the excursion to the King's Head public house where 3 pints of Thwaites Ales were enjoyed in excellent surroundings. On returning to boat the crew felt in necessary to consume the freshly purchased Pork and Stilton pie along with some salad and bread. Narrowboat Holly continued its journey along the Stratford canal stopping briefly at the Major's Green draw bridge, where Jim took great delight in stopping all the traffic on a busy road to allow the slow passage of the boat though the bridge. The crew guided the narrowboat Holly onto the Birmingham Worcester canal at Norton Junction and again traversed the long Wast Hill Tunnel to arrive at Hopwood on schedule. After filling their water tank for the last time the narrowboat slipped into its planned mooring location adjacent to the Hopwood House Inn at 7-15pm. The crew enjoyed dinner at the Inn of curries and steaks with several pints of Banks Original until the barrel ran dry. Continued drinking took place with some Jennings Cumberland Ale, which was to the liking of most members of the crew. As had become usual practice the crew returned early to the boat for coffee with cheese and biscuits. 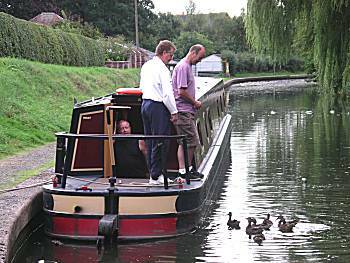 Discussions took place to add yet a further excursion to the route with the boat passing its home boatyard the following day and travelling on to Hanbury Wharfe to visit the Eagle & Sun, before turning the boat to return to the Boat & Railway for our final evening. Two members of the crew were awoken during the middle of the night to see a large barge pass by, navigating in the dark using a giant headlamp. Again with great anticipation of the forthcoming Tardebigge locks, the narrowboat left its moorings early at 7-05am to travel the short distance through the Shortwood and Tardebigge tunnels to arrive at Top Lock. The crew were somewhat frustrated by the slow progress down the flight of 36 locks, following a number of craft with inexperienced crews. In addition, time was wasted by a surprisingly large number of boats coming up the flight, which had to be passed carefully in the lock basins, with Jim driving. All were surprised and intrigued to pass the narrowboat "Gloria", which was used by the crew during their holiday last year. The current crew on the boat, especially the 2 daughters, were quizzed as to whether it continued to perform well and if they were correctly looking after it. The home boatyard was passed at gone 1-30pm and guided onwards towards the Astwood flight of 6 locks. Again this took longer than expected and narrowboat Holly finally arrived at Hanbury Wharfe at nearly 4pm, to attempt the difficult process of turning the 70' boat in the narrow canal. 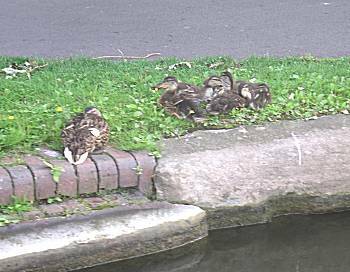 This was accomplished with great skill by Ron, in the entrance to the disused course of the Droitwich Junction canal. 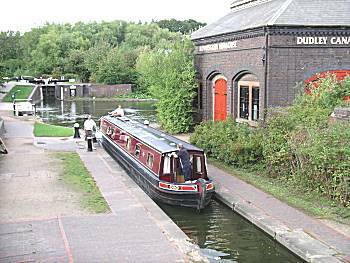 To the great disappointment of the crew it was found that the Eagle & Sun closed at 3pm and the despondent crew returned to their boat to return up the Astwood locks to moor for the evening at Boat and Railway. Arriving at the moorings for the final night at 5-30pm, Jim found it necessary to check out the pub for the evening, whilst the others showered and rested ready for an enjoyable last evening. Jim returned to the boat having checked the quality of the beer with the news that, since their last visit, the skittle alley in the pub had been changed into a Carvery Restaurant and that many locals were reserving tables. Neil offered to visit the establishment as a matter of urgency to reserve a table for the 4 crew at 7-30pm. The crew selected the excellent carvery Dinner, which was considered both wholesome and good value at £5-95 per person. Two members (Ron & Neil) succumb to the delights of the sweet trolley. As this was the last evening on the boat the crew sat on the canalside edge taking benefit from the patio heaters and consumed 5 pints of Bank Original ale. All remaining traces of the cheese and biscuits were consumed afterwards on the boat. The boat was a hive of great activity from an early hour, with the crew packing their belongings and cleaning and tidying the boat ready for the handover back to the boatyard staff. Porridge was again enjoyed by 3 members of the crew. Ron took the narrowboat for the last mile back to the boatyard passing up the final lock. The transfer of the belongs was swiftly achieved and the crew left the boatyard before 9am to start there journey back to their homes.